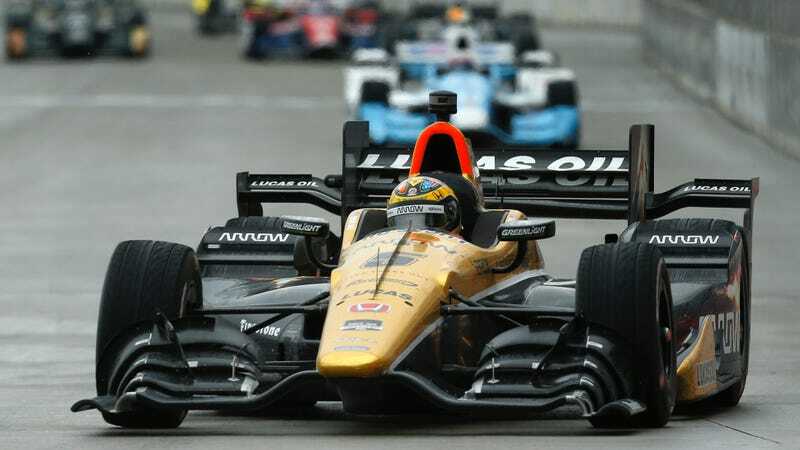 Rain is a blessing and a curse, both in the messy race it produced today at the Belle Isle Grand Prix as well as the tendency for rain to throw unexpected entries into higher than usual entries. Today, two substitute drivers—Tristan Vautier and Conor Daly—got into 4th and 6th place, respectively. The first half of the race was entirely caution-free, which was a nice departure from yesterday’s wet bumper car race. After lap 37, though, it all went downhill from there. The street course was starting to dry and the changing conditions caught several racers out. You get the idea. The end of the race saw a caution every three laps or so. It was utterly ridiculous. Sébastien Bourdais ultimately won overall, having managed his fuel well enough to run away from the rest of the field on the final restart. Two substitute drivers, however, made the race’s end a pleasant surprise. Conor Daly had been tapped by Schmidt Peterson Motorsports to drive the number 5 Honda in place of James Hinchcliffe. Few expected the young driver to do such a spectacular job this weekend as a stand-in, however, at one point, Daly was leading the race! Daly lost his first-place position after a pit stop on lap 51 and never made it back up. A penalty for blocking after that sent him to the back of the field, yet he still managed to claw his way back up to sixth place at the end. More surprising was Dale Coyne Racing’s stand-in of choice, Tristan Vautier. Vautier had stood in for two different drivers for the Indianapolis 500 for the team, one in qualifying and another for the race. For Detroit, the team opted to have him drive the number 19 car. In that sense, Vautier may or may not technically be a substitute for this race, but he’s certainly a stand-in driver success story. Vautier finished fourth in the Dale Coyne Racing car with little drama. Dale Coyne Racing isn’t exactly a team associated with the front of the grid, having had four different drivers for their number 18 car and three different drivers in their number 19 car for 2015 alone. I’d imagine these two are pretty happy at the moment. If you need someone to fill in for a weekend in an IndyCar, you now know who to call.